My Top 5: Lush Christmas Products! 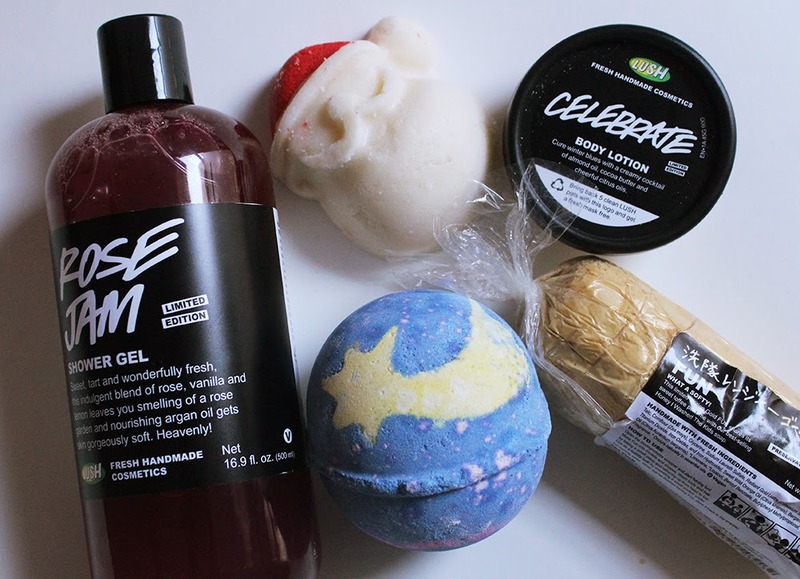 Christmas is just about here and that means you only have a few more days to get your hands on the limited edition goodies from Lush! For this holiday season, I'm working part time as a seasonal sales associate at Lush so I've had plenty of time to get to know the products. Here are my top five favorite holiday products that I highly recommend and urge you to check out before they're gone! Rose Jam Shower Gel - The rose jam scent is my absolute favorite from Lush and also comes in the form of Rose Jam Bubbleroon and Ro's Argan Body Conditioner. The shower gel is great because I can use it daily and still feel pampered without all the hassle of filling the bath or adding an extra step with a body conditioner. Ingredients like argan oil and vanilla pod infusion also make this shower gel extra special and give your skin a little extra moisturization. Celebrate Body Lotion - Celebrate is a citrus champagne lotion that pairs brilliantly with Rose Jam. I didn't fall in love with this lotion until I used it after showering with Rose Jam but I'm so glad I found this combination. Celebrate is thick and creamy but blends into the skin nicely so I don't feel greasy. It's a gorgeous body moisturizer if you've got dry skin! Sandy Santa Body Butter - This scrubby yet moisturizing bar is akin to Buffy in that it does double duty in the shower. Sandy Santa is the cutest little guy and smells citrus-y and refreshing. Sugar and sand do the exfoliating while murumuru butter from Brazil conditions the skin. Gold FUN* - This limited edition 4-in-1 product can be used as a soap, shampoo, bubble bath and play-doh-esque toy in the tub. Other colors are available all year round but Gold FUN is special in that it has beautiful fine, golden shimmers and it smells like Honey I Washed The Kids. I used to be ambivalent towards Honey I Washed The Kids but now it's one of my favorite scents. Go figure! Shoot for the Stars - This bath bomb has the Honey I Washed The Kids scent and is one of the most stunningly beautiful bath bombs. The night sky inspired design looks like a work of art and turns your bath water into a stunning array of blues, yellows and pinks. Watch the video below to hear more about each of these amazing products! Did you get anything from Lush's holiday collections this year? What are your favorites? *Full disclosure: I received my bar of Gold FUN for free during my training with Lush but I chose it myself out of a basket of goodies. I bought all of the other products that were mentioned. I was not obligated to do this post whatsoever and simply enjoy using Lush products!